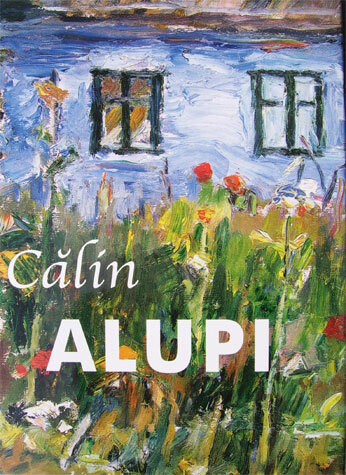 "Unskilled in creating any by-pass, I try to give back with sincerity to the world what I owe it - the range of emotions experienced in front of its forms and colours - never so poor that I need to invent them"
Calin Alupi (1906 - 1988) is one of the greatest names of Romanian Post-Impressionism, cited along with Baba or Ciucurencu when one considers contemporary Romanian art. His work can be found in the most important galleries of Romania (Bucharest National Art Gallery, Iasi Art Gallery, etc. ), as well as in diverse private collections in Romania, France, Italy, etc. The son of poor farmers in Bessarabia (the extreme north-east of Romania, at the borders with the actual Ukraine), Calin Alupi’s childhood and adolescence was spent amidst the nature of the small farm and the surrounding country side. His fond memories of the landscape with its inhabitants, and simple way of life formed the basis for most of his work. There was nothing in his early childhood to encourage his later vocation, until his entrance to the high school in Sendriceni, aged 13, where the desire to paint was suddenly sparked. 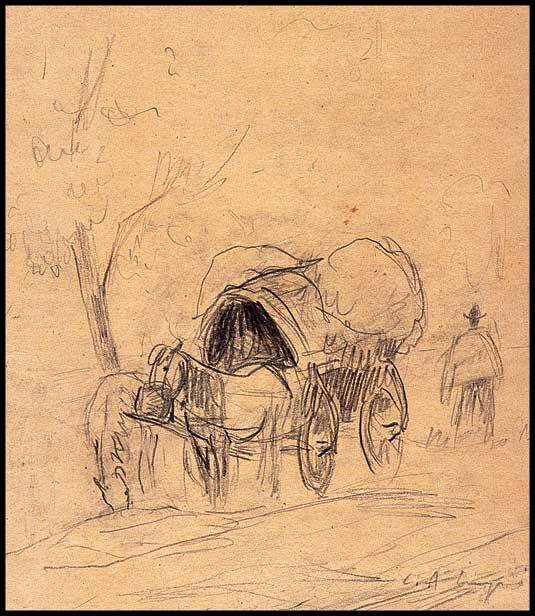 His teacher, Nicolae Popovici Lespezi, discovered that he had promising talent and encouraged him. By 1925 he had entered the Iasi Fine Arts Academy under the tutorage of Stefan Dimitrescu. Poverty dogged him for all of his life, but it was a particular burden during these just years, alienated only by a meager bursary obtained with the help of Stefan Dimitrescu. 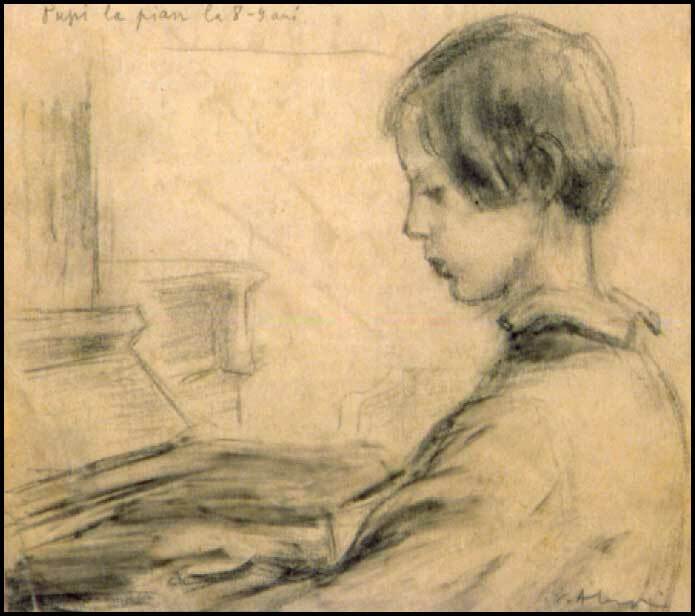 By 1933 he had begun to exhibit his work, both individually and in conjunction with other painters. Two years later he moved into a supply teaching position at his previous high school. 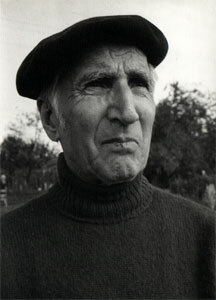 When Nicolae Tonitza was comissioned to decorate the Durau monastery, he chose Calin, along with Corneliu Baba, Mihai Camaruts and others, to be part of his group of apprentices. The war, however, brought these artistic projects to a halt. In 1940, Alupi was conscripted and posted to the front line, where he remained for the duration of the war. His responsability, under these extremely dangerous conditions was to draw enemy positions. After the armistice was signed, Alupi walked the long journey home from Odessa, consequently developing a stomach ulcer and kidney stones. These health problems hampered him severly for the rest of his life, required him to undergo ten operation and left him unable to pursue a continuous career. 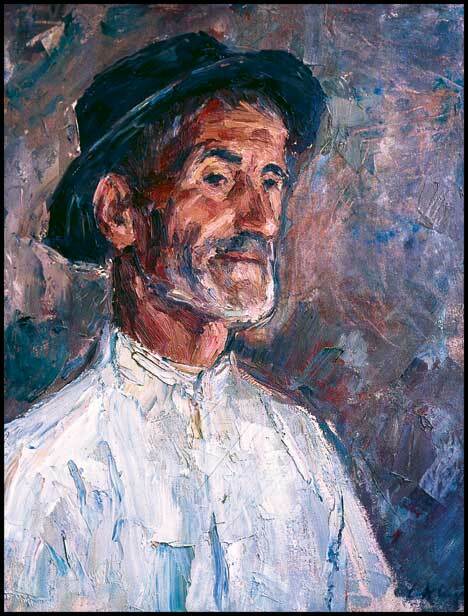 In 1947, aged 40, he was appointed to the position of professor at the Iasi Fine Arts Academy. In the same year he married Sanda Constantinescu Ballif, who, three years later, gave birth to their daughter, Antonina Alupi. (Antonina is now a painter and painting teacher in Paris). 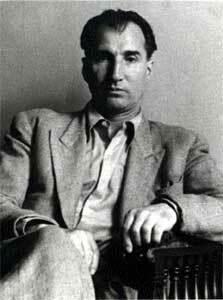 After the closure of the Iasi Fine Arts Academy in 1954, Alupi resettled in the capital with his young family. During the next nine years he occupied a professorship at Bucharest’s high school specialising in art, returning to Iasi in 1963 without his family when the Iasi Pedagogic Institute (formerly the Fine Arts Academy) reopened. At his retirement in 1968 he moved back to his wife and child in Bucharest where he remained for a further twelve years. His final move back to Iasi, accompanied by his wife, came in 1980. There he was able to stay, in the town which held his greatest affection, until his death in 1988. During his life, C. Alupi exhibited frequently at two or three yearly intervals. These were held predominantly in Romania and included his solo exhibitions, the Interregional Fine Arts shows held in Iasi, and the Annual Exhibitions of Fine Arts in Bucharest. However, his work was also exhibitited arround Europe : as part of group collections (Sofia, 1954 ; Warsaw, 1955) ; and in individual shows, in Italy (Rome and Trieste, 1971) and France (Paris and St. Germain-en-Laye, 1979). Anti-careerist, he never wanted to work under the commission of the Communist Party. Consequently he was kept relatively out of the spotlight. In fact he neglected self-promotion altogether. A remarkable drawer, his works are recognizable for their precise yet dynamic virile touch. His subjects, often simple and always drawn from reality, convey a deep understanding of human nature and the Romanian landscapes. He painted quickly and had a gift for capturing a powerful emotional connection with the subject. His technique was not to prepare complex compositions ; instead, he preferred a style of authenticity that honestly conveyed his affection for the “common man” and the poor: a society in fact from which he came, and the people for whom he had the greatest affection. It is this very sentiment which runs throughout his work and unites it all. Trees, domestic animals, meadow flowers, the most decayed huts and slums, all of which have a soul that demands to be heard. They, in fact, are the most worthy of being listened to, because they are the most sincere. This sincerity he reciprocated in his treatment of them, being careful not to artificially embellish them, or, as he once said, not to “lie to them”. The artistic feeling, for Calin Alupi, is nothing else than an innocent love, a spontaneous bond of sympathy sparked at the moment of creation, between the artist and his model. It is from this perspective that one should consider the entire work. The Calin Alupi Reference Book (hardback) is now available ! It can be purchased for 150 Euros, including mailing fees. It was edited by Nicolas Petrescu-Alupi, the grandson of the painter, with texts in three languages (mainly Romanian, but also English and French) ; it has 215 pages, including 133 high quality color prints among which the majority of the paintings on this website. Format is 33 x 25 cm. We will mail it as soon as we receive your payment, and it will reach you in about 2 weeks. Pictures of the 2006 Dana Art Gallery exhibition in Iasi, where the book was originally promoted. From 15th May to 9th June 2002 at the Houses of Parliament in Bucharest (ex-Palace of Ceausescu), the first major national retrospective of Calin Alupi's work was held. This exhibition was cmprised of around 150 works drawn from two galleries and seven private collections, reunited especially for the occasion. It was organised by the Romanian Parliament in conjuntion with the Association of the Friends of Calin Alupi, and sponsored by the President of the Chamber of Representatives. His father dies at the front in Galicia, being a soldat of the russian imperial army. 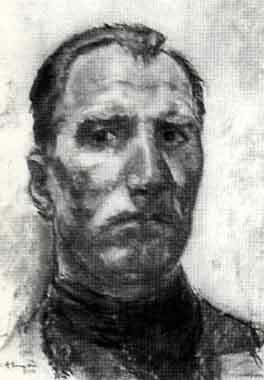 He becomes pupil of the Normal school of Sendriceni - Dorohoi, his drawing teacher is the painter Nicolae Popovici Lespezi. Student at the Fine Arts Academy of Iasi, his teachers are Jean I. Cosmovici for artsitic drawing and Stefan Dimitrescu for painting. During his studies, he is employee at the Iasi library. He obtains the Schiller grant and the Grigorovici prize. He is student at the Officer of the Reserve school of Bacau. Graduate of the Fine Arts Academy of Iasi, painting section, avec la mention maximale. He exhibits at the Official exhibition of Moldavia organized in Iasi. Supply teacher at the Normal school of Sendriceni, in the Drawing and Calligraphy section. He goes back to Iasi and participates at some local exhibitions. From now on he paints under the direction of Nicolae Tonitza (with Corneliu Baba, Mihai Camarut and others) the Durau monastery, at the foot of the Ceahlau mountain. He exhibits with the moldavian artists group "Grup Iesean", at Bucharest, Dalles hall, with Al. Clavel, Mihai Camarut and N. Popa. The exhibition was favourably commented in the newspaper Adevarul literar si artistic. He is sent to the front. He does all the war in the front lines - being in charge of drawing the ennemy positions. 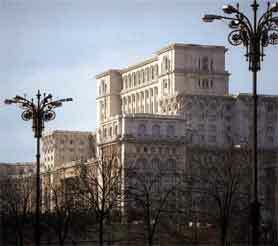 He exhibits at the Official painting and sculpture exhibition of Bucharest. The lieutenant of the Reserve Calin Alupi receives the "Order of the Rumanian Crown" with swords in the Knight Grade and the "Military Virtue" ribbon. His decoration for special arm deeds is mentioned in the Monitorul Official of the 7th of April 1945. Ehibits with moldavian artists at Bucharest, Dalles Hall, near Ion Irimescu, Petre Hârtopeanu and Nicolae Popa. He is promoted assistant in the drawing section of the Fine Arts Academy of Iasi, he quickly becomes professor. Participates at the Anual State painting and sculpture exhibition organized in Bucharest. Participates at the regional graphic art exhibition of Iasi. 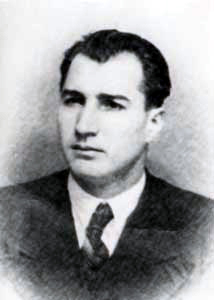 He marries Sanda Constantinescu Ballif. Teacher at the Plastic Art Lyceum of Iasi. Birth of his unique daughter, Antonina, painter and teacher in Paris. Participates at the Anual State plastic art exhibition organized in Bucharest. Participates at the Rumanian Art Exhibition of Sofia ; il y reçoit un prix d'honneur. Exhibits at the Anual State plastic art exhibition organized in Bucharest. He is promoted professor at the Plastic Art Lyceum of Bucharest. Participates at the Interregional Plastic Art exhibition organized in Iasi. Participates at the Rumanian Graphic Art exhibition organized in Varsovia. Participates at the Anual State Graphic Art exhibition organized in Bucharest. Exhibits at the Interregional painting, sculpture and graphic art exhibition - Iasi. Participates at the Anual State Graphic Art exhibition of Bucharest. His presence is noted in a report by Petru Comarnescu, in the newspaper « Informatia » of january 1958. Exhibits at all the Interregional painting exhibitions of Iasi. Documentation trip in Hungary and Czechoslovakia. He is promoted painting teacher at the Pedagogical Institute of Iasi. Personal exhibition at the Corso Galeries - Trieste (Italy). Personal exhibition at the Centro Australiano Qantas in Rome. Exhibits at the International Art Exhibition of Paris. 19 February - Evocation « Nicolae Tonitza » at the Homage Party organized by the National Art Muzeum of Rumania. Personal exhibition at « Caminul Artei », Bucharest. Personal exhibition at the Art Galeries, Iasi. Participates at the « Voronetiana » Artistic Festival, Suceava. Retrospective Exhibition - National Art Muzeum, Bucuresti. Evocation « Stefan Dimitrescu » at the Homage Party organised by the National Art Muzeum of Rumania. Participation at the Maison Nationale des Artistes Exhibition in Paris. Personal exhibition at Saint Germain en Laye, France. Pastel exhibition at the Book House Galeries in Iasi. Exhibition in the Cultural Committee Galery of the Iasi department. 20 July - Homagial Party Culture Palace of Iasi for his 80th birthday. Exhibition in the « Coanda » Hall. 19 September : Calin Alupi dies at the age of 82. He is burried in the Eternitate cimetery (Iasi).